Apple is "leaning heavily" towards choosing Intel's 5G modems for its future iPhones, according to Fast Company. Apple engineers are said to be already working with Intel on upcoming 5G technology. Apple's discussions with Qualcomm about 5G modems, meanwhile, have been described as "limited." Citing a source with knowledge of Apple's plans, Fast Company says that while Qualcomm 5G modems will offer more specialized carrier features, many of those features will not be adopted by carriers, leading Apple to believe Intel's hardware will be sufficient for future devices. The end game, multiple sources have said, is to build the Intel modem onto an integrated system-on-a-chip (SoC) that would also contain the CPU, GPU, and other iPhone components. The SoC would be co-designed by Intel and Apple and would be fabricated at an Intel facility. Intel reportedly has "multiple thousands" of people working on 5G technology in an effort to catch up with Qualcomm and win the contract from Apple. Intel this morning said that it had made "substantial advances" in its wireless product roadmap to accelerate the adoption of 5G. 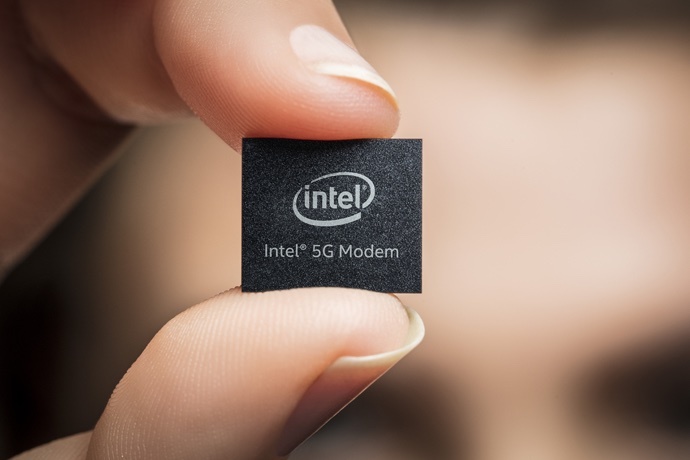 According to Intel, an end-to-end 5G call based on early 5G silicon has been completed successfully, which Intel says is a "key milestone in its development." Intel expects its first 5G chips to roll out in 2019, ahead of the wide rollout of 5G networks. T-Mobile just today said that it is planning to roll out its fifth-generation network across the United States by 2020, and most of the carriers in the United States are already experimenting with limited trials. 5G is expected to deliver speeds that are 10 to 100 times faster than the average 4G connection, at a gigabit per second or higher, along with lower latency and other benefits. Rumors that Apple is considering Intel's 5G technology are in line with previous reports that have suggested Apple is considering eliminating Qualcomm chips from its 2018 iPhones and iPads. Apple and Qualcomm have been embroiled in a bitter legal battle since the beginning of the year, which has continued to escalate over the months. Apple believes Qualcomm charges unfair royalties for "technologies they have nothing to do with," while Qualcomm claims its technology is "at the heart of every iPhone." Apple and Apple suppliers have ceased paying royalties to Qualcomm amid the dispute, while Qualcomm has filed several patent infringement lawsuits against Apple and has asked for import/export bans in the United States and China. Don't even bother with CDMA. Stick with Intel, Apple. GSM all the way. Just my 2 cents. Another bad news for Qualcomm. I wonder if they really became greedy or being bullied by Apple and all other giants. Well considering they sue anyone that tries to go with anyone else but them... I'd venture to say they're pretty greedy. It's what's driving many manufacturers to explore other options. 5G is what will be needed as billions of IoT devices need to connect to the internet. With things like connected cars, a million different other connected items, and even more people on smartphones consuming ever increasing amounts of content, we need to make this move. Some think this just means getting to watch a YouTube video quicker but that's a really uninformed understanding. It's about much much more than just getting you your content quicker (though that is a small part of it). With the move to 5G, it'll become a real option to switch from having a cable modem with Comcast or other provider at home and just go totally wireless. Current 4G LTE isn't quite up to the speeds cable modems can offer but with 5G, we get much closer and it becomes a real option. This time, Timmy will make sure the FM reception is physically stripped out! Greater bandwidth to fill webpages with more data hungry advertising. Why doesn’t Apple put in the research to build a cellular chip in-house? Same with displays. They pay out billions of dollars to competitors (Qualcomm and Samsung) for very expensive components. They already make the A11, M11, Secure Enclave, Face ID, and all of iOS, which are are an order of magnitude more complex than a modem. The bombshell in this article has nothing to do with 5G. Apple dropping TSMC and using Intel to fab their SOC would be a major strategic win for Apple. I’m sure others will offer more interesting analysis, but Intel’s fab process is second to none, and I’m sure Apple could cut power consumption if they gain access to Intel’s foundries. I’d hate to guess more than a 10% reduction but honestly I’ve no idea. It will be interesting to see how this plays out!